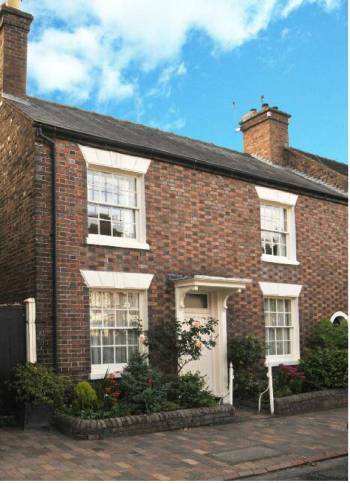 Garden Cottage is a listed, double-fronted, small town house on one of Bridgnorth’s loveliest streets. It offers exceptional accommodation to those who wish to get away from it all without leaving behind the comforts of modern living and the convenience of nearby shops and the other facilities of the town. It can sleep six, in three bedrooms. A larger party may like to consider making an additional booking at Churchdown House, the bed and breakfast property next door, which can also accommodate six and is under the same management. Bridgnorth is a friendly and charming market town, evoking the atmosphere and way of life of earlier times, set on the borders of rolling South Shropshire countryside. The town is divided between High Town built on a sandstone bluff some 200 feet above the valley of the River Severn and Low Town on the banks of the river. Garden Cottage is conveniently located in a quiet cul-de-sac in the historic High Town close to many shops and amenities. A delightful park and the evocative ruins of Bridgnorth Castle are moments away. In the locality are excellent opportunities for fishing and several good golf courses which welcome visitors. The World Heritage Site of Ironbridge, birthplace of the industrial revolution, with over a dozen museums and the famous Blists Hill Victorian Village, is just eight miles distant and many other visitor attractions are within easy reach. The Severn Valley steam railway runs for sixteen miles to Kidderminster with many stops along the river providing varied walks and villages and country parks to explore. Family from Norway, October 2015: Back in our second home! Couple from Southampton, May 2015: We had a wonderful Spring Break in Garden Cottage. Come and enjoy this peaceful place. Family from Australia, September 2013: This has been the most lovely cottage to visit. We have loved every part of it, particularly the beautiful garden. Couple from Bournemouth, May 2014: We couldn’t have been more fortunate with our choice of cottage. Family from Germany, December 2013: We really loved staying in Garden Cottage for the Christmas week. It has become our home and we don’t want to leave!